Iraq’s army is focusing on cutting off Islamic State of Iraq and Levant’s (ISIL’s) supply lines as U.S. advisers on the ground assist the Iraqis and the Kurdish peshmerga in preparing for an assault on Mosul. 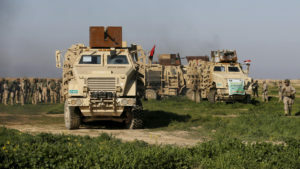 The U.S. military has asked the White House to deploy up to 500 additional troops to Iraq, according to U.S. officials. ISIL is said to have some 3,000 fighters remaining in Mosul. “The idea is to isolate Mosul, cut it off, kill it,” a senior U.S. Central Command officer told Politico. Iraqi Prime Minister Haider al-Abadi said earlier this week that Iraqi forces began an operation on Sept. 21 in Shirqat, a town north of Baghdad, to further damage ISIL supply lines to Mosul in preparation for a larger battle. Iraqi and Kurdish forces, backed by the U.S.-led coalition, are said to be developing a pincer strategy that would see Iraqi troops advancing from the southeast and Kurdish units coming from the northwest. The military offensive is said to be tentatively scheduled to begin sometime in early October. The Centcom officer, however, stressed that the operation will in no way be rushed for political purposes. If the White House approves the request, American personnel officially deployed to Iraq would increase from 4,400 to about 4,900. The Pentagon also maintains up to 1,500 additional troops in Iraq who are on temporary assignments or not included in formal military tallies, according to a report by the Washington Free Beacon. The Obama administration has maintained that ground troops in Iraq are not engaging in direct combat, but are serving in advise-and-assist roles to local forces. A dual offensive targeting Mosul and ISIL’s de facto capital in Syria at Raqqa was hinted at by Lt. Gen. Sean MacFarland, the U.S. officer commanding the anti-ISIL effort, in a July 11 news conference.